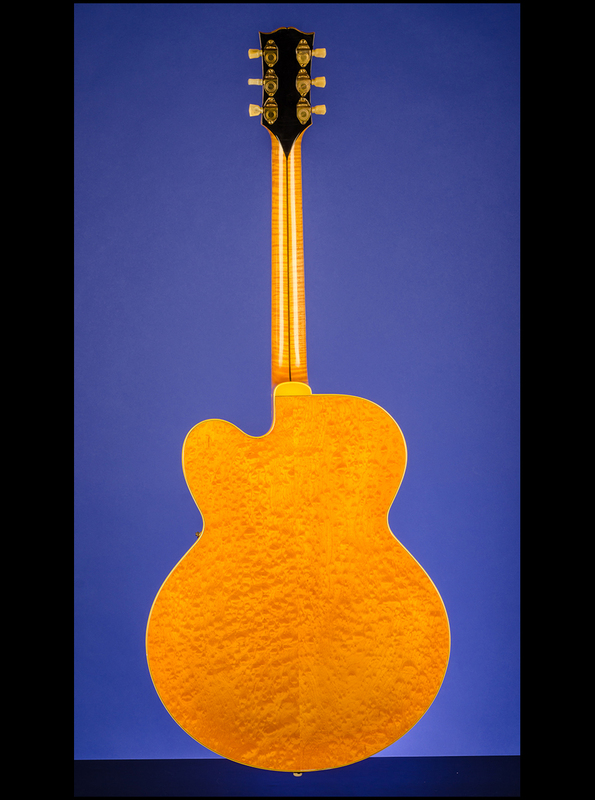 L-5NE 'McCarty' Guitars | Fretted Americana Inc. This magnificent 17-inch-wide blond L-5 CNE weighs just 6.80 lbs. 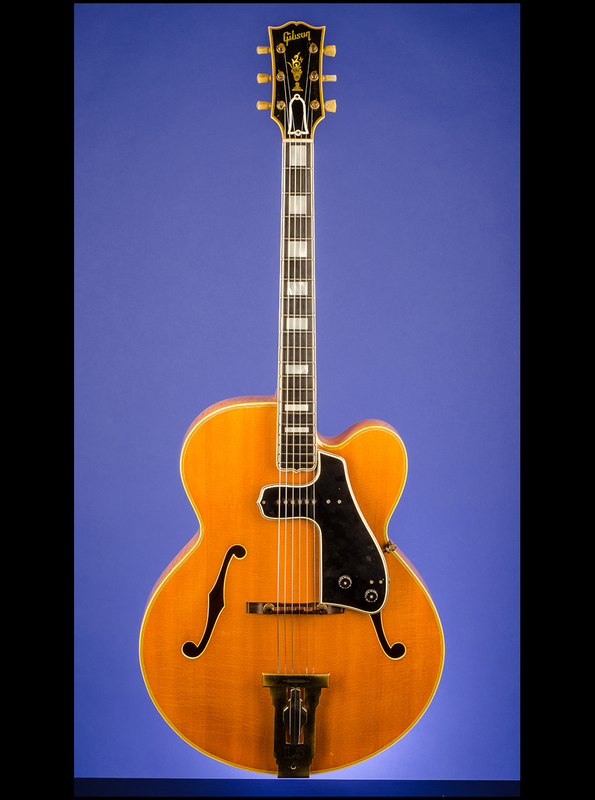 and has a perfectly book-matched carved natural spruce top with a highly-flamed two-piece 'birds-eye' maple back and highly-flamed curly maple sides. Two-piece highly-flamed curly maple neck with a center mahogany strip, and multi-bound ebony fretboard with a small, graceful point at the end of the fretboard. 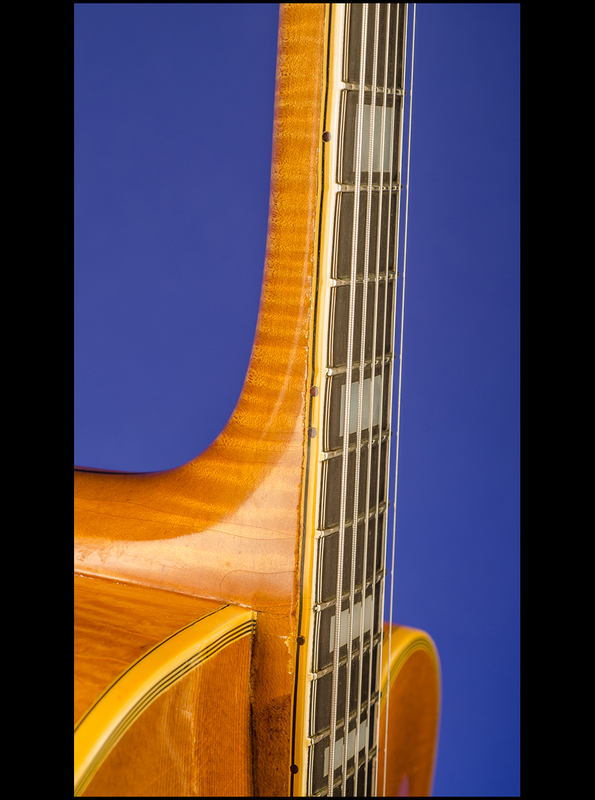 The nut width is just under 1 11/16 inches and the neck profile is nice and thick starting at 0.90 inch behind the first fret and rising gently to 1.00 inches behind the eleventh fret. Twenty original medium-thin frets, and inlaid pearl block position markers. 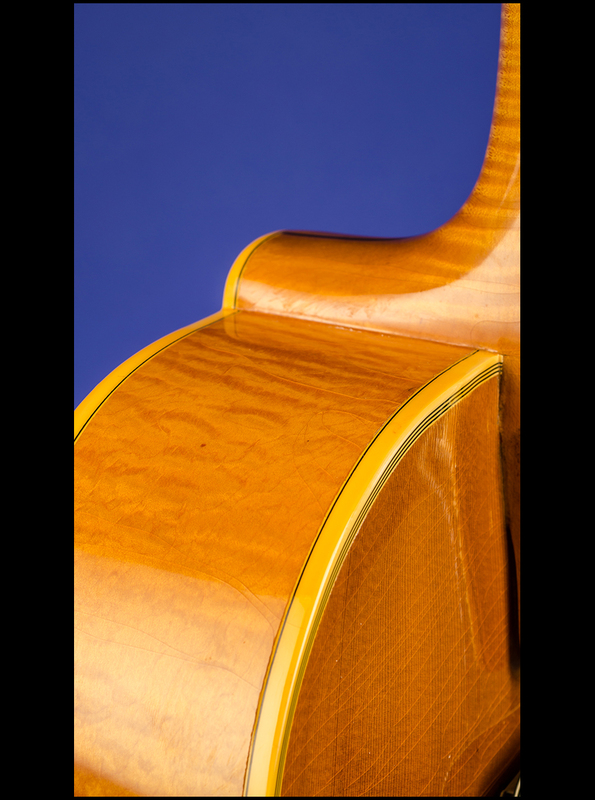 Nine-ply binding on the top of the guitar, five-ply binding on the back, and single-bound f-holes. 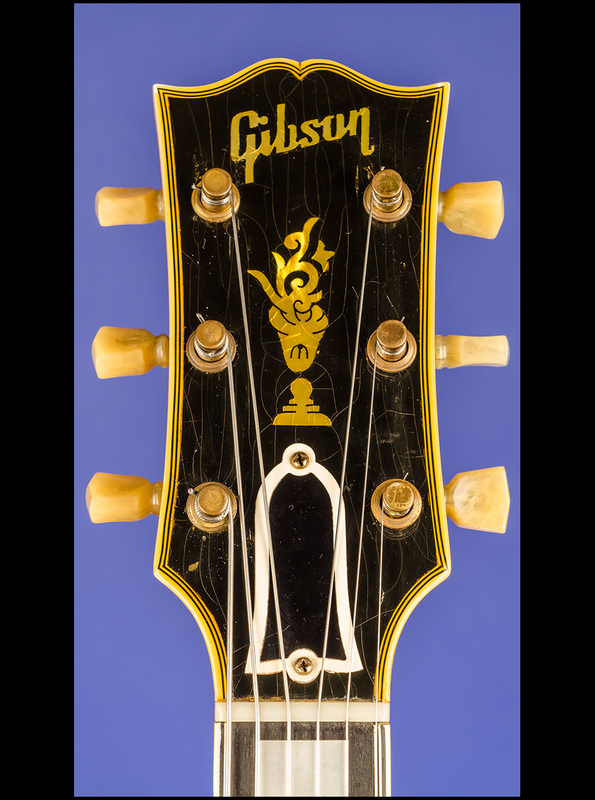 Multi-bound headstock with inlaid pearl "Gibson" logo and pearl "L-5" flowerpot inlay. Black plastic bell-shaped truss-rod cover with white binding. Black-painted headstock rear face with widow's peak. Individual Kluson Sealfast tuners with tulip-shaped metal buttons. Original Gibson 'McCarty' single-coil pickup (with an ouput of 5.55k) with non-adjustable, flat pole pieces mounted into a five layer black over white plastic laminated pickguard together with one volume and one tone control with Centralab potentiometers and a regular (instead of the screw-on type) input jack. Black plastic circular knobs (9/16 inch in diameter, 5/16 inches tall) with ribbed sides. Inside the bass 'f' hole is the original Gibson white oval label with Style number "L5-CES" written in ink and the serial number "A-2995" (March 1949) stamped in black. Inside the treble 'f' hole is the FON (factory order number) "305 7" (late 1953) stamped in black. 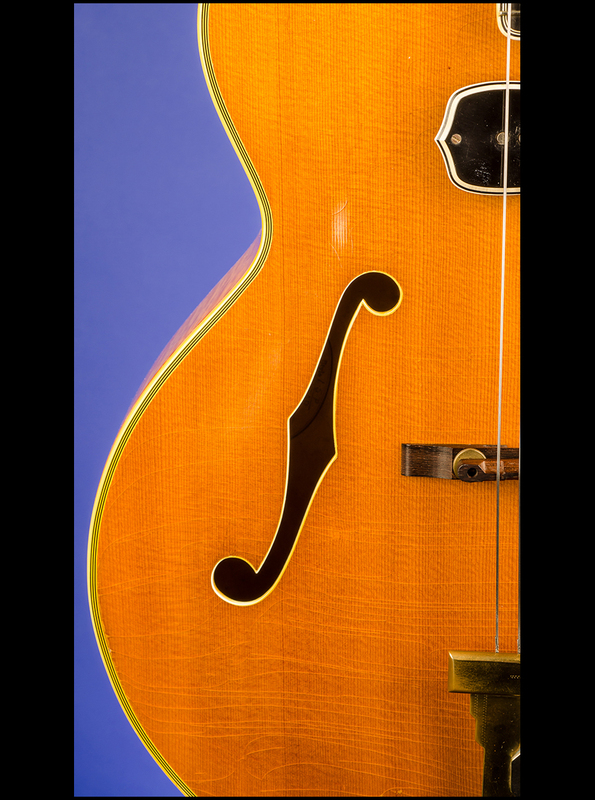 Original multi-bound tortoiseshell pickguard. 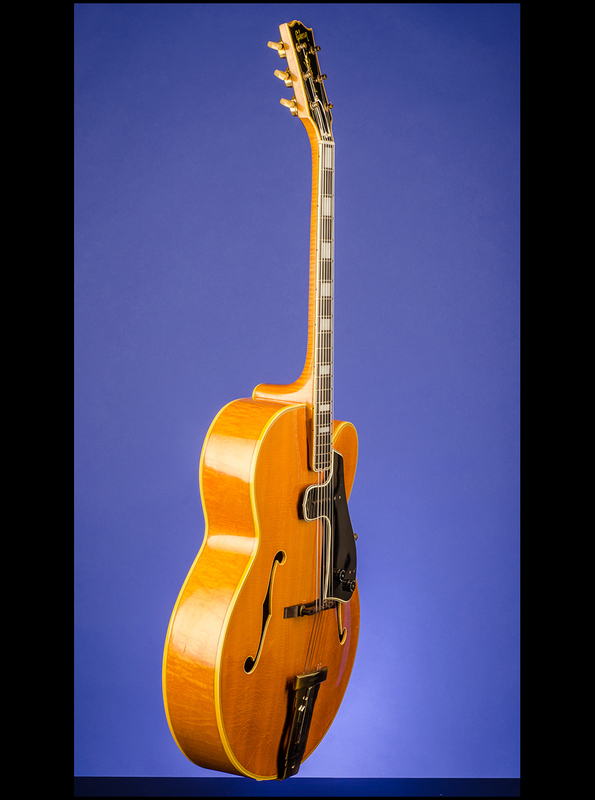 Original Gibson rosewood bridge with pre-set compensating saddle on height-adjustable rosewood base and gold-plated flat plate tailpiece with engraved "L 5" and small hole at the bottom center (for allen wrench tension adjustment). All hardware gold-plated. Under ultra-violet light (and only under UV) there appears to be a 'filled-in' small hole on the back of the headstock where assumedly a previous owner had fitted a strap-button. 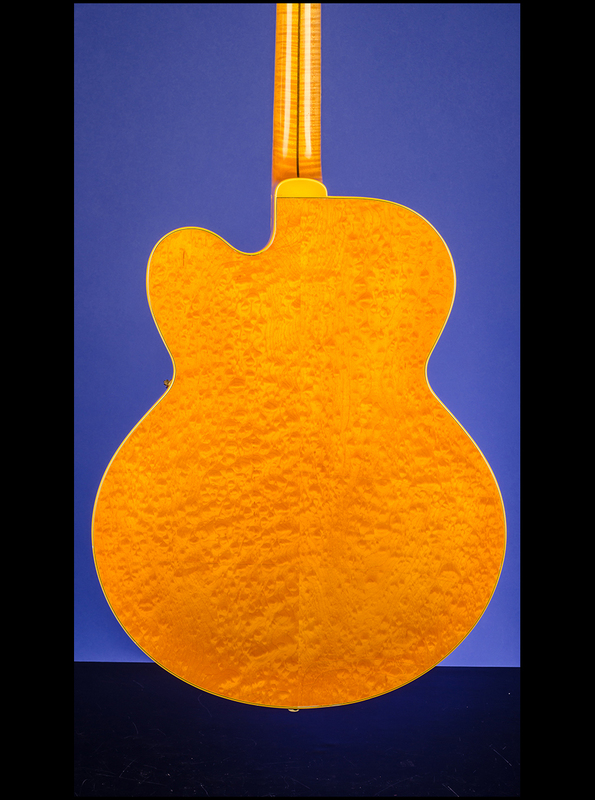 There is some fine finish checking on the back and a few miniscule marks on the top, but otherwise this incredible guitar is truly in near mint (9.25) and totally original condition. 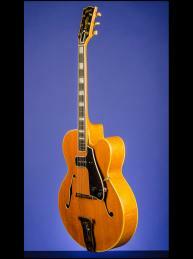 Housed in its original Gibson four-latch brown hardshell case with pink plush lining (9.25). 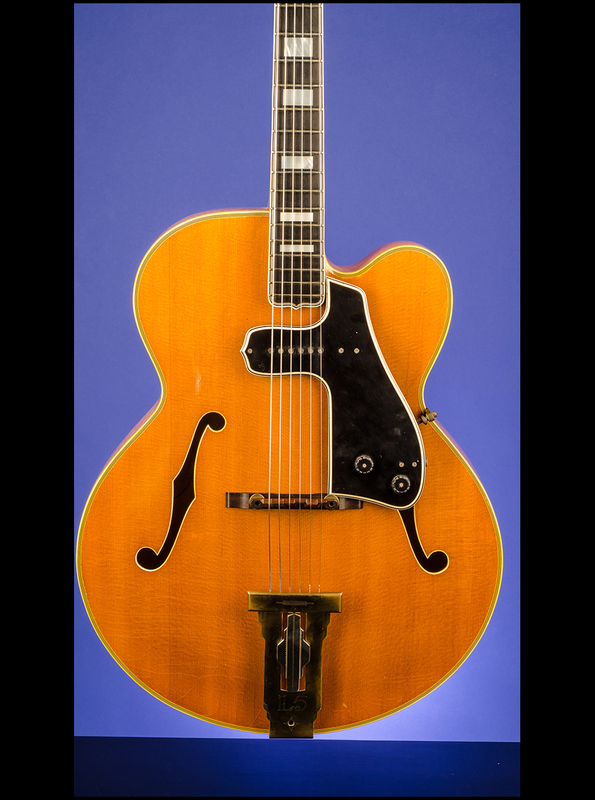 "The first cutaway L-5s produced after World War ll (1947 and 1948) often will bear the designation "L-5P" on the label inside the body. Thus, technically these post war guitars are also considered L-5 Premiers like their prewar ancestors. 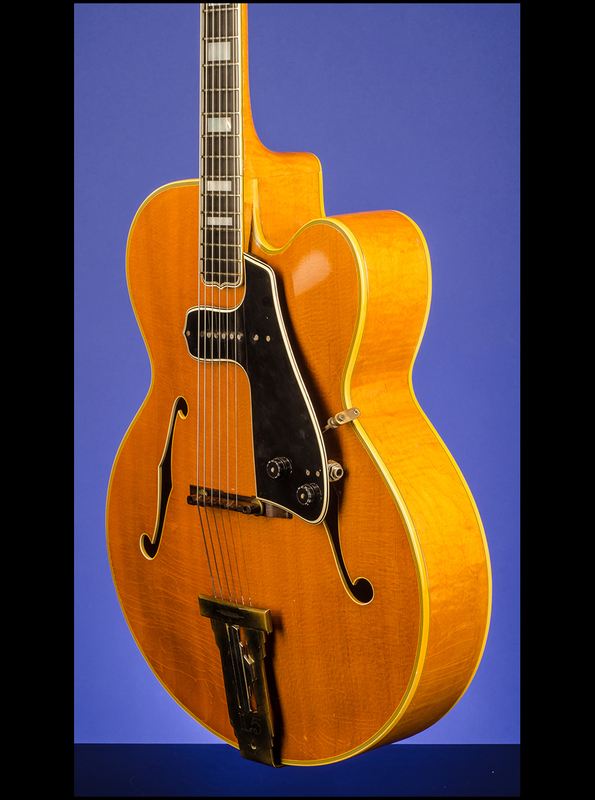 Some subtle changes in ornamentation occurred between the prewar and postwar guitars, and these early postwar instruments are usually combined with the L-5C and L-5CN totals beginning in 1949 when one takes an overview of the postwar L-5 cutaway guitar." 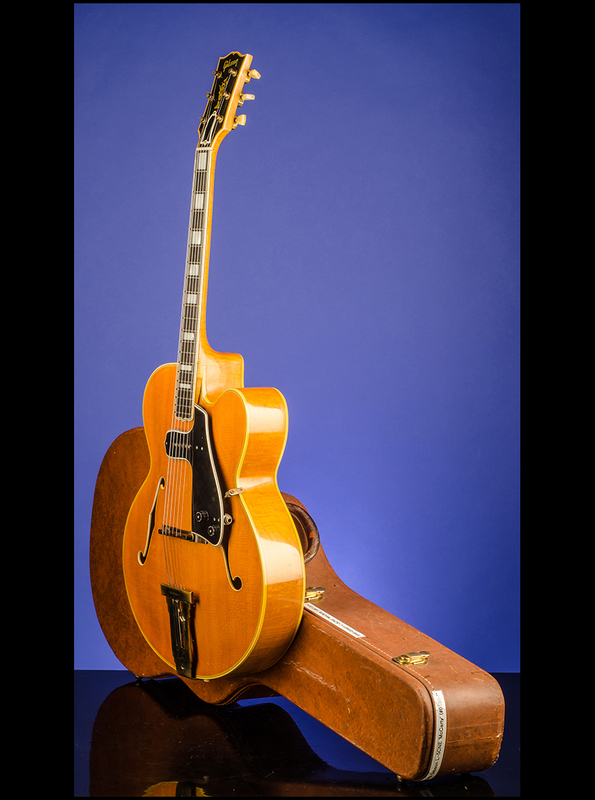 "In 1948 Ted McCarty joined the Gibson company, and one of his first priorities was to expand the potential number of Gibson's electric guitar models in a quick and inexpensive way. He invented an ingenious pickup/pickguard assembly known now as the McCarty pickup, consisting of a very thin single-coil pickup with non-adjustable, flat pole pieces mounted into a laminated pickguard along with volume and tone controls and an input jack. The McCarty pickup assembly was offered in single - and double - pickup versions, for cutaway and non cutaway guitars, and for guitars with nickel-plated parts and gold-plated parts. 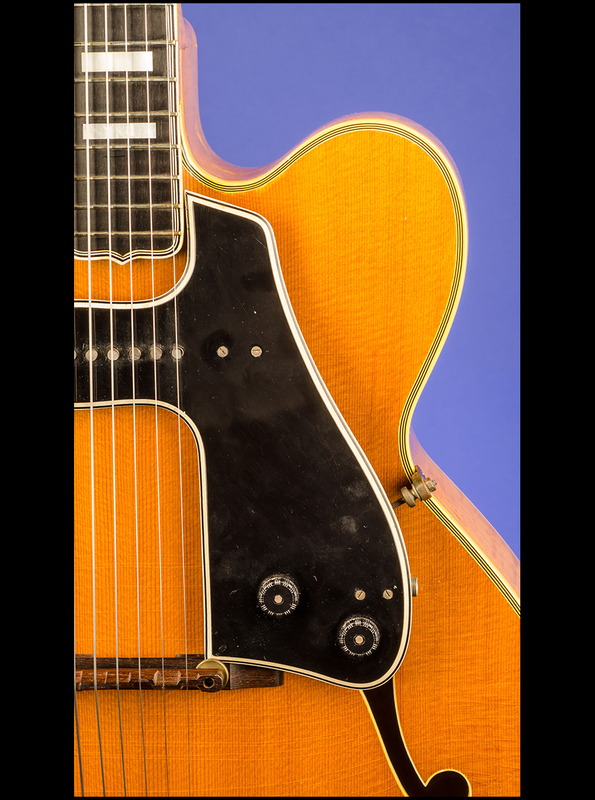 The pickup was officially introduced on the L-7 guitar as an option, and these early electric L-7s were labeled the L-7E or the L-7PE, with the letter E designating their electric status, while P indicated Premiere, or cutaway, body style. In reality, these were stock L-7 guitars that had the McCarty pickup assembly supplied with them at the factory instead of a conventional acoustic pickguard." (Van Hoose. 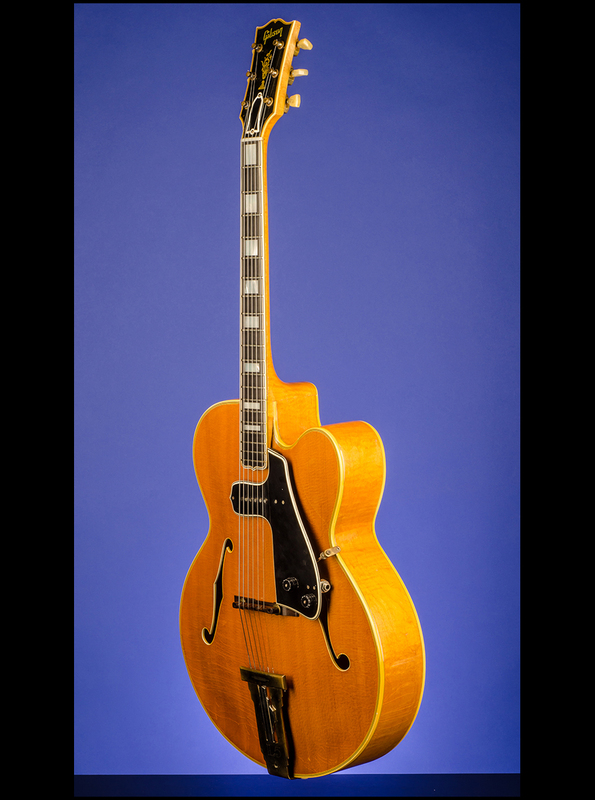 The Gibson Super 400 [and L-5], pp. 55-56). 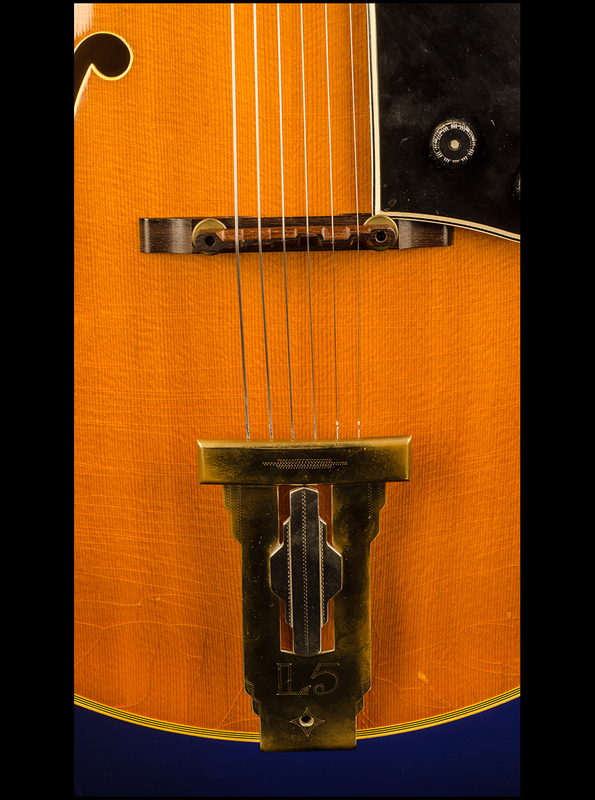 This is the first L-5CN with the optional factory fitted McCarty pickup assembly that we have seen.